Blood Ties depicts South Africa’s Cape Town minus the varied neighborhoods and complexities that characterize large cities. But the novel provides the setting in which two high school girls try to carve out lives in the most disadvantaged sector. These friends, Pholisa and Lelethu, have diverse experiences and life styles that enliven the novel, while they simultaneously expose Cape Town’s dysfunctional social conditions (e.g., the spasmodic opportunities for employment that produce financial as well as psychological insecurity). Pholisa’s brother, Masixole, is the third major character—the one bringing to light the city’s criminal world. 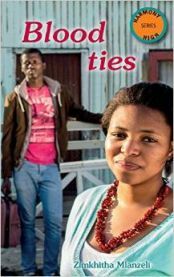 Put together these are the stresses upon Pholisa as she tries to discourage Lelethu in her unrealistic pursuit of showbiz fame, and as she helplessly watches Masixole’s ties becoming deeper in a crime syndicate. But the lives of girls such as Pholisa and Lelethu are not entirely downbeat. They have parties; they sip milk shakes at an ice cream parlor; they enjoy wearing clothes other than school uniforms; they converse often with text messages; and even though Lelethu becomes increasingly threatened by her own naivete (e.g., she answers an ad that constitutes a veritable trap for dancers), Pholisa has the opposite experience when she meets a student who becomes her boyfriend. The term “blood ties” is treated as part of African tradition or, put differently, revolves around the continuity of family and extended family bonding. Masixole’s crimes lead him ultimately to a seven year prison term, and Pholisa tells him, “‘We’re tied by blood,'” “‘I’ll always be there . . . .”” (144). She is voicing their solid attachment despite her brother’s criminal record. And to put it mildly, Masixole’s actions were horrendous. He has raped Pholisa’s friend, Lelethu, and nearly killed her. He has worked for a truly sadistic crime syndicate. He has helped plan gang rapes and the kidnapping of girls who will suffer the cruelty of the syndicate’s customers. But ultimately the novelist finds ways to pace the narrative’s high and low moments. She fleshes out events that influence a high school student’s gift of resilience alongside his or her economic deprivation. Pholisa sums up the jobless problem as it impacts her brother’s situation (his battle with depression), and its impact on the lives of unemployed men in general. For men, she says, “Work is their sanity” (29).